West Hill is a people, a place, and an idea. We are a community living out a progressive faith, striving to make a positive difference in our own lives, the lives of others, and the world. Moved by a reverence for life to pursue justice for all, we inspire one another to seek truth, live fully, care deeply and make a difference. Over the past many months, we've been challenged to engage broadly about who we are and what we see the future of church can be. We'd be delighted to talk with you about it and have extended an invitation to congregations across the country to reach out if they are interested in having a conversation with us. It can be about what this "theologically non-exclusive" church is really like. It might be about the rise of the "Nones" and how we are engaging them. You might want to just talk about the review of our minister. Whatever your interest, we will find a way to engage. So be in touch and let's set a date. Support West Hill! Learn more or donate now through CanadaHelps. Want to contribute? Email the webmaster. has volunteered to make Christmas Hampers for 10 families with children. You can help share the joy! White Gift envelopes are in the lobby. Insert your cash or a cheque payable to West Hill United Church, and place it in the collection plate. Volunteer to help with delivery of the hampers. Our winter book study kicks-off in January. The 12th will be the first of our bi-weekly gatherings, but to get the ball rolling we need to choose a book! If you plane to attend this year's book study or would like to read along with us, please vote for the title that catches your interest. In fact, pick the top 3 and send them along to the team who will tally the results. Fundscrip Gift Cards - A perfect time to order! Will you be picking up a gift card or two this season? We have had wonderful success with folks ordering gift cards for regular weekly expenses such as groceries, pharmacy and fuel, as well as those little extras for gifts, entertainment, restaurants and retail goods. From 1% to 10% of our everyday purchases will be automatically donated back to West Hill United Church! Imagine buying groceries and gas, clothing, and entertainment, things you already buy each week from your favourite stores, while earning money back to West Hill United Church. A complete list of retailers is available at on the FundScrip website at Retailers. You'll also find list of special deals that offer us a boost when purchased during that mothly promotion. Hmm....Sounds good. So, what’s the catch? The catch, if there is one, is that you need to be a little organized in your shopping; however, you already buy groceries and gas on a regular basis. You know how much you spend and where you like to shop. So, as it turns out, the idea of buying gift cards for those purchases a couple of days in advance isn’t such a “catch” after all. Just imagine, if you spend $200/week on groceries and you pre-purchase your grocery gift card through our group, that is $6.00 back to West Hill United Church per week. In 10 months, you alone could earn a minimum of $240.00 back to West Hill United Church, simply by doing something you do everyday … and that is just groceries. Add gas, entertainment, and clothing and that amount will rise substantially. The only other "catch" is that you need to come to the Church to pick up your purchases...or you could designate someone to pick up your purchase on your behalf. Enrollment is easily done via Enrollment Link. Our Group Invitation Code is YWVFVW. As always, we thank you for you generous support! Join us for our Affirming Celebration this Sunday! West Hill became an Affirming Congregation, officially welcoming LGBTQ2S people into leadership roles at West Hill, in 2009. In fact, we had included diverse sexualities and genders in congregational leadership for some years before but realized that, from the outside, it was hard to tell we were welcoming. Since our initial celebration, we've recognized our diversity every year on the first Sunday of December. In the past WHU has hosted members of the LGBTQ community - George Smitherman, Kathleen Wynn, Kamal Al-Solaylee, EJ Kwandibens, and others. Irene Miller joined us when she was President of PFLAG. This year we are welcoming Pascal Murphy and Sarah Jean Harrison who will share their inspirational story for those of us who wish to do more in our own communities as allies. Pascal is an award winning Instructor at Ryerson University who teaches in the areas of Homelessness, Disasters and Social and Environmental Justice. He was critical in the creation of the Social Justice and Peace Studies program at King’s University College at The University of Western Ontario and completed his degree in this program in 2004, followed by a Masters in Environmental Studies at York University in 2009. Today, Pascal is Board President for St. Clare’s Multifaith Housing Society, one of Toronto’s largest non-governmental/non-profit affordable and supportive housing providers. Pascal is a passionate advocate for social justice, a vocal advocate for the LGBTQ2S+ community and co-founder of Peace Flag House, a community-orientated creative agency in Toronto, Ontario focused on cultivating positive social and environmental change. Sarah Jean Harrison is a social justice activist, educator, publicist and digital storyteller that believes in the power of a good story to change the world. She holds a BAH in Women’s Studies and a Masters in Environmental Studies. Sarah Jean has been an educator in the fields of social and environmental justice for over 12 years and is currently an Instructor at Ryerson University where she teaches on homelessness and poverty. Her educational approach draws upon the work of Paulo Freire and Popular Education, focusing on the notion of praxis – combining theory with practical action. Sarah Jean applies her educational approach to developing strategic communications for ethical and sustainable non-profits, businesses and lifestyle brands at Peace Flag House, a community-orientated creative agency she co-founded in Toronto, Ontario that focuses on cultivating positive social and environmental change. 24 Hours of Reality - Watch Party! Watch Party at West Hill United! Together, we will solve the climate crisis. Every year for a single day, the Climate Reality Project invites us to unite across the globe to demand solutions to the climate crisis. Renowned scientists, business leaders and a star-studded cast come together to give voice to our committment in taking the steps to solving this crisis. Join Deb Ellis at West Hill United Church on Monday evening at 6pm, as we watch a part of the broadcast of 24 Hours of Climate Reality with Al Gore and others around the world. Learn about what's happening, and what you can do - and enjoy great food and great company! *Drop-in, come when you can. The hour-long segment specific to Canada is from 8-9PM EST. It is that time of year when joy is all around. Lights, tinsel and gift giving are on everyone’s mind. What if Christmas time brings sadness or emotional distress? Often loss, any loss death of a loved one, loss of a job or relationship, estrangement from family or friends creates sorrow at a time when culture expects you to be joyfilled. These losses are often compounded during the Christmas season. What if all you want to say is “Bah! Humbug!” and no one will allow it. Come and let down your grief. Share time in a safe space where you can speak openly about your feelings regarding this time of year. Bring your blues and see if we can leave them in the circle so you can leave with a lighter heart and a purpose to get you through the Santa-season. Cynthia is a graduate of Laurentian University with a BA Hons in Gerontology and Religious Study. She graduated 2013 from Emmanuel College with an M.Div. which has sparked her passion for spiritual care. Matthew Fox defines Spirituality as “our everyday experiences of depth and deeper meaning and the connection that they carry. Spirituality is present wherever we undergo or observe deeply”. She has worked with aging adults for many years teaching and growing her understanding of optimal aging. To age well is to do so with purpose and passion. Cynthia is a mother of two, grandmother of two, an avid runner and triathlete, a health and fitness instructor with a passion for sharing and teaching. The culmination of her experience and training combined with her supercharged personality make her fun and approachable. Please join us for this special session with Cynthia on December 16th from 9:30-2:00. Let us save you a seat; sign up in the WHU lobby or message the office to register. *Gretta will join the cast for a post-show conversation on November 29th. Unholy, written by Diane Flacks, is a examination of contemporary women in organized religion. The play is set as a debate where four female panelists answer the the question: "Should women abandon religion?" The four panelists are: A progressive Muslim Lawyer, an Orthodox Jewish spiritual leader, an excommunicated nun and a lesbian atheist. This play delivers a whip-smart, hilarious debate that becomes personal and heated, allowing for the women to see the connections and disconnections between them. This play was nominated for Best New Play at the 2017 Dora Awards. Here is Diane's short video testimonial on her reason to speak. As Canada’s foremost feminist theatre, Nightwood provides an essential home for the creation of extraordinary theatre by women. Founded in 1979, Nightwood Theatre has created and produced award-winning plays, which have won Dora Mavor Moore, Chalmers, Trillium and Governor General’s Awards. The company is led by Artistic Director Kelly Thornton and Managing Director Beth Brown, who have received public acclaim in artistic excellence, advocacy, and their successful training and development of emerging female talent. The team at the Broadbent Institute are thrilled to share with you an opportunity to learn more about the strategies and practices that lie behind today’s most successful advocacy campaigns, based on Networked Change in Canada, a groundbreaking report Broadbent Institute published earlier this year. The report, based on a U.S. study by authors Jason Mogus and Tom Liacas, features Canadian case studies of campaign innovations in this country. This participatory webinar will provide a deep dive into the principles outlined in the report and into one of the Canadian case studies profiled in the report. Our goal is to share a model that can be learned and replicated by other campaigners for how to blend grassroots participation and organizing with disciplined central planning to win. The webinar is an opportunity for you to learn more about how to put these ideas into practice. A digital pioneer for two decades, Jason Mogus is the principal strategist at NetChange Consulting (formerly Communicopia). He has led digital transformation projects and campaigns for some of the world’s most recognized social change organizations and movements. In 2012, he created the world’s first report on non-profit digital teams and in 2015 was named a fellow of the Broadbent Institute. His campaigns have won elections and Webby awards, raised millions of dollars, and transformed dozens of institutions, leaders and teams for the digital world. Logan joined Leadnow in the spring of 2012, organizing national days of action on climate, democracy and a fair economy. She managed Leadnow’s national organizing program in the lead up to the 2015 federal election. Using a digitally-enabled, narrative-based, distributed organizing model, Leadnow engaged over 5,000 volunteers who had over 50,000 live conversations. Logan loves working with the Leadnow community and is committed to exploring how it can use digital tools to scale the impact of its organizing program, bring new people into the political process, and deliver impact on critical campaigns. Logan is now based in Toronto, but also calls Edmonton and Vancouver home. The Webinar is scheduled for December 5th from 2:00- 2:45 pm. Who knew giving back can be so sweet! 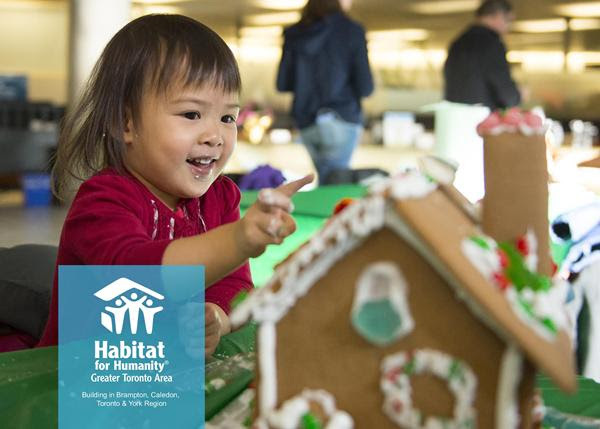 Kick off your holidays with Habitat for Humanity GTA’s 15thAnnual Gingerbread Build. Purchase your Habitat Sweet Home gingerbread kit online. Sign up online to join us at City Hall on December 2nd and decorate your gingerbread house together with other families. There's no sweeter way for families and children of all ages to give back and make a difference this holiday season. It also makes for a great office team building activity, too! All funds raised from gingerbread kits help build Habitat homes for families in need of decent, affordable housing. A Colloquium sponsored by Toronto Southeast Presbytery featuring conversations on Christian discipleship and how we build up the household of faith. Featuring (among others) Gretta Vosper, Robin Wardlaw, Ellen Vesterdal, Brett Boyko, Tom Reynolds, Bronwyn Best, members of the West Hill congregation and other communities of faith. Our purpose is to hear one another, make space for differences and build on common ground. Live streaming will be available for this conference. Please visit the College Street United website on thursday morning to access the link. For those who'd like to email questions during the sessions, please do so and the facilitators will do their best to have them included and addressed. 10:00 -10:45 Brett Boyko and Gretta Vosper Topic: At the beginning of my ministry what should I do to prepare myself…what are the big issues? 11:00 - 12:15 Robin Wardlaw and Gretta Vosper:Topic: At the end of my career, what have we accomplished and how do you see our community of faith moving forward? 1:30 – 2:30 Bronwyn Best and Gretta VosperTopic: How do we act justly and how do we know that we act justly in the new world we are facing…where do we find our ethical authority? 2:30- 3:00 Break3:00 - 4:00 Chris Levan and Gretta VosperTopic: Is it possible to believe without having an object for that belief? 7:45 – 8:30 Ellen Vesterdal, Topic: What is the future of Christian liturgy and music? 8:30 – 9:00 Chris Levam and Gretta VosperTopic: When we die? This Colloquium is sponsored by Toronto Southeast Presbytery featuring conversations on Christian discipleship and we are so grateful for it’s support. Thank you to our community business partners for supporting WHU programs!